Turmeric is a plant that has an ancient history of medicinal use. It’s acted as a healing remedy for more than 4000 years and is one of the most studied substances in modern dietary medicine today – with over 3000 publications concerning turmeric released in the last 25 years. 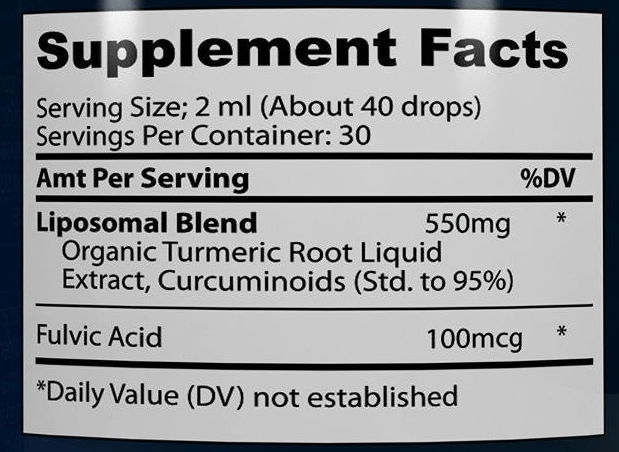 InFuse™ Liposomal Turmeric is 185 times more absorbable than turmeric in its natural form. Our Liposomal Delivery protects the turmeric from breakdown in the digestive tract, delivering a powerful, soothing dose right where you need it. 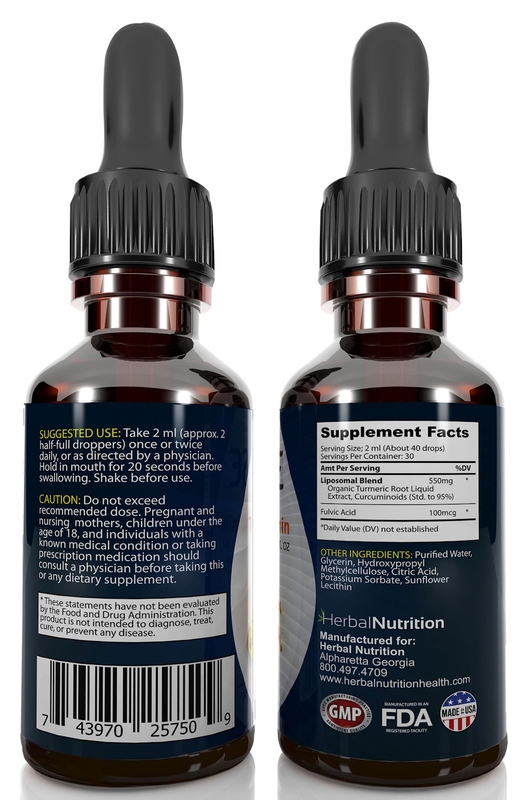 Our proprietary formula also includes Fulvic Acid which provides a myriad of health benefits. Among these, Fulvic Acid is known for systemic anti-inflammation properties, which works synergistically with the Liposomal Turmeric Curcumin in our formula. 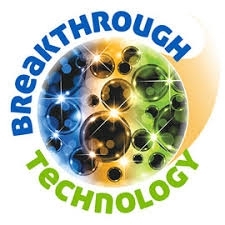 We have also included Lecithin and Glycerin for their ability to enhance bioavailability and provide faster uptake. 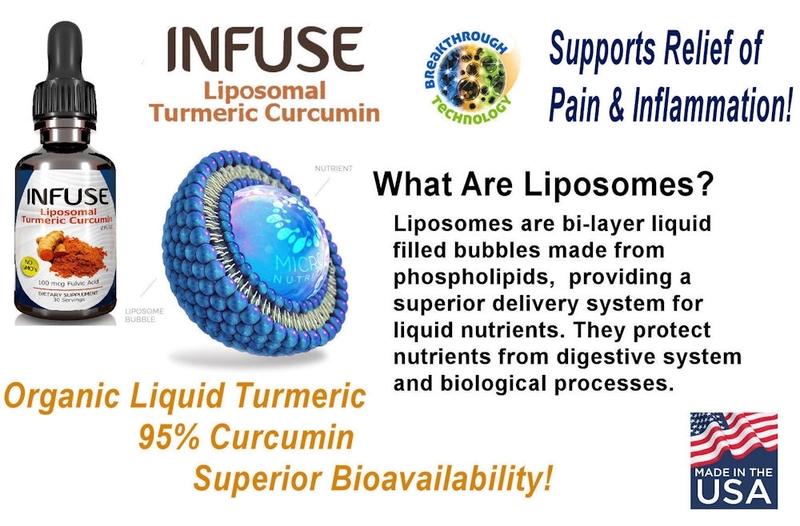 We will email you All About Liposomal Turmeric Curcumin after your purchase, to explain the science behind the Liposomal Turmeric Curcumin Formula. Take 2ml (approx. 2 half full droppers) once or twice daily, or as directed by a physician. Hold in the mouth for 20 seconds before swallowing. Shake before each use. Do not exceed the recommended dosage. Pregnant or nursing mothers, children under the age of 18, and individuals with a known medical condition should consult a physician before using this or any dietary supplement.. I LOVED this product. I have arthritis in my fingers. This was the Only thing that took the pain away. It also has made it possible for me to lose weight because it kills inflammation in the body. When your body is fighting inflammation it makes it near impossible to lose weight. I am extremely pleased w this product and would recommend it to anyone suffering joint pain and inflammation. Five stars for pain relief, works great for my lower back pain. Also no stomach issues that I had with the capsules I tried. I had given up on taking Curcumin until I found this! Well, it's turmeric - and it's Fully organic. I began by taking as directed on the bottle, and it had the effect, thats why I thought to write a positive review. This product had quiet good effect on my joint and back pain. I think I will drink the entire bottle and order more. Love this extract. I have taken other Tumeric in the pill form and this seems to be much better in helping my joints feel better. I can tell when I have forgotten to take it as I get stiff. I have taken capsules and now this liquid. This product seems to work better than capsules for me, and it tastes great, is easy to take. Plus I have found the 95% curcumin is the level that works for my joint pains. Easy to take. I put a dropper full under my tongue twice a day. There is very little taste so pleasant to use. I have been taking this product for 2 weeks. I would consider the effects to be miraculous.. I had injured my shoulder a few years ago, I went from 20-30% mobility with pain to 75 or 80% mobility with no pain. 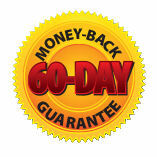 If you live in constant pain with relief only coming from heavy NSAID's, try this product. 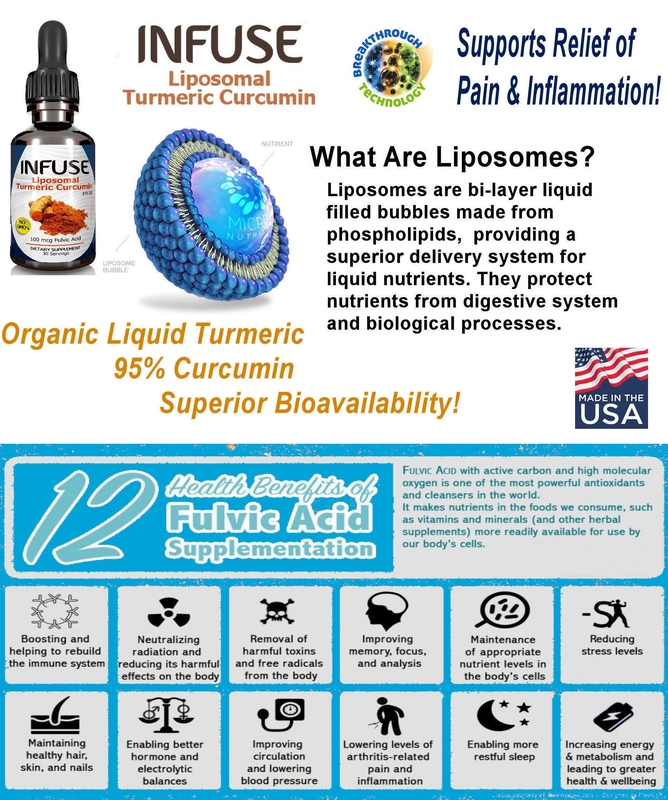 I had trouble with the turmeric capsules causing heartburn and found the perfect solution with this liposomal turmeric. I didn’t have the heartburn AND it works better. I can’t take NSAIDs so this is the perfect alternative for me for an anti-inflammatory. My joint pain has significantly improved, almost to the point of becoming non-existent. Shipping is fast and reliable. Sellers are very friendly and service oriented. I get an email from them every time I order.